Who doesn’t like chocolate? When i saw this Raspberry Chocolate Crunch recipe on the foodmatters website and there was no way I was going to attempt it. This recipe is simply delicious. So quick and easy to make. You can make a big batch and keep it in the freezer for when you feel like a sweet treat. And what is best about this recipe is that it really, truly is good for you. 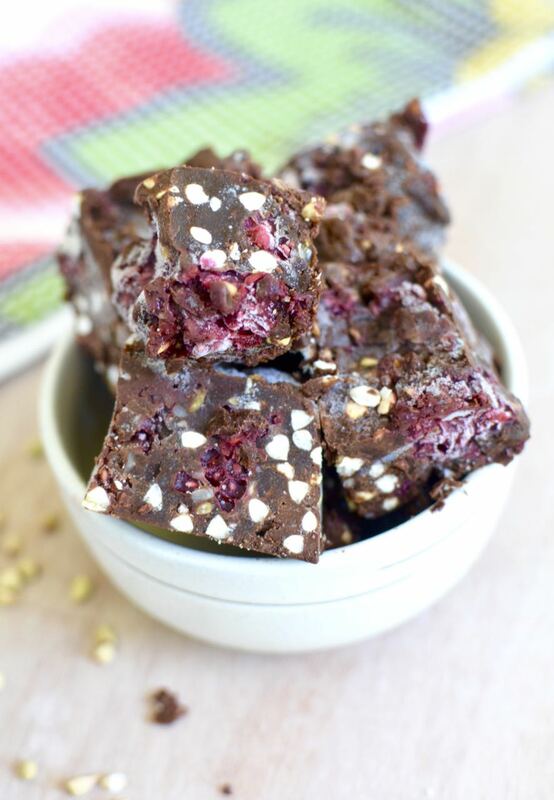 From this recipe you will get a nice dose of healthy fat from the coconut oil, antioxidant boost from the cacao and a pinch of fibre from the buckwheat and raspberries. Yes there is a little sweetness from the maple syrup, and that I think is great for the soul. A consistent healthy diet is not about deprivation or rations. It’s about exploring ways to make foods that are truely delicious so that you choose to eat these over commercially made equivalents. In a mixing bowl, add cacao, maple syrup, melted coconut oil, vanilla and nut butter. Whisk together until combined well. Mix through raspberries and buckwheat groats / quinoa puffs.